The so-called ‘Trump trade’ continues to push up share prices on Wall Street. European markets also gained. All the main US stock indexes hit record intraday highs on Monday and the total value of the shares in the S&P 500 topped $20 trillion for the first time ever. Investors are optimistic about the future of the world’s biggest economy based on President Donald Trump’s statement last Thursday that he was going to make a major tax announcement in the next few weeks. 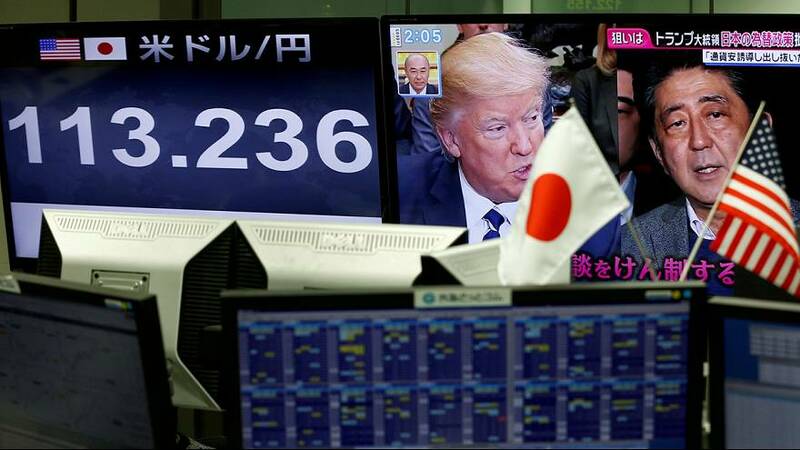 The stock market rally that followed his election had previously stalled due to concerns that he would move to protect US companies with import tariffs and a lack of clarity on policy reforms. Financial stocks and banks in particular were the biggest gainers in New York. The boost to share prices has been fuelled by expectations Trump would lower corporate taxes, reduce regulations and increase infrastructure spending, boosting economic growth and corporate profits. “At some point there has to be actions that match the words and I think we are getting closer to that point,” said Brent Schutte, chief investment strategist at Northwestern Mutual Wealth Management. The same expectations pushed the dollar to a near three-week against a basket of currencies on Monday. Company fundamentals also remain robust, with strong economic data in recent weeks supported by upbeat corporate results. Companies listed on the S&P 500 are on track for their strongest profit growth in nine quarters, according to Thomson Reuters. “What is underlying this whole Trump rhetoric is that fundamentals in the world, including the US, are getting better,” Schutte said.